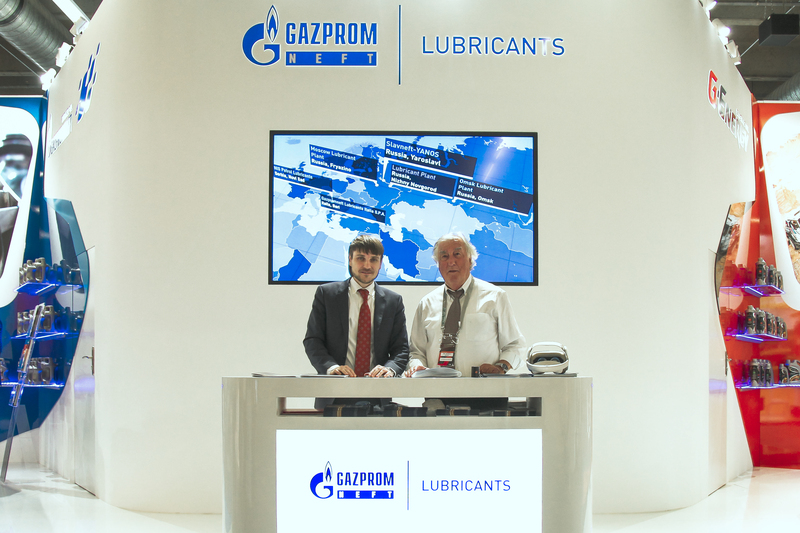 Gazpromneft Lubricants Ltd., the operator of Gazprom Neft’s oil business, presented advanced lubricant technologies in Frankfurt. Technical workshops were held within the framework of Automechanika 2018, one of the largest industry events in the field of production of spare parts, automotive components, equipment and goods for vehicle maintenance. The company’s R&D center employees* shared the latest trends in the development of the global lubricants market, new technologies and innovative products with the partners from Europe, Africa and Asia as well as media representatives. In particular, cutting-edge developments in manufacturing of specialized products were presented, for instance, biodegradable oils and lubricants for wind power generation. Particular attention was paid to products that guarantee high fuel efficiency and, thereby, contribute to reducing the harmful environmental impact. As an example, the company presented its G-Special Hydraulic HVLP oils**. The participants of the event also could observe the operation of the unique portable complex – the mobile laboratory***, that allows conducting a spectral analysis execution of the equipment unit and draw conclusions about its operating state practically in any conditions on the basis of a single oil drop. Similar complexes are used by the company’s employees to work with professional racing teams, trucking enterprises, ore mining and processing plants, and also partner dealer centers. “It is the first time that we participate in such a major industry event using the workshop format. Establishment of an open dialogue has become for us a positive experience in organizing discussions with the professional community and journalists. We are confidently building cooperation with foreign partners, as we have developed substantial expertise in the field of lubricants production, and also have advanced technical services. Our knowledge and experience are in demand not only in the Russian, but also in the international market”. *R&D (Research and Development) center of Gazpromneft-Lubricants was established in 2016 on the basis of product management and development. The subdivision was formed in order to accumulate its own scientific base. The main goal of the centre is the product development that will meet the advanced requirements of the machinery manufacturers. **G-SPECIAL POWER HVLP – oils designed for the usage in mining, construction, forestry, agricultural machinery, as well as in industrial equipment. They are created with the unique technology in cooperation with Evonik Group (German chemical components manufacturer) and ensure uninterrupted operation of the equipment at extreme high and low temperatures, protecting the hydraulic system and saving fuel. All this helps to increase the efficiency and lifespan of the equipment. ***Mobile laboratory is a unique, compact complex that allows performing the oil spectral analysis directly on a race track. The laboratory is equipped with two high-tech instruments: Fluid Scan IR spectrometer and xSort xRF spectrometer. The first of them evaluates the degree of oil ageing as compared to a fresh product sample. It measures the relative depletion of the additive package, base number decrease, determines the extent of product contamination with coolant, water and soot, determines the degree of the product nitration, oxidation and sulphatation. The measured values of these parameters make it possible to diagnose the condition of the engine systems and to estimate the degree of the product ageing. xSort xRF spectrometer shows metal content of working oil samples. Metals in oil are products of parts wear, additive indicator elements, external contamination products. The measured parameter values allow diagnostics of engine parts, determination of the presence of external contaminants, estimation of operating properties of the product.